From the oven to the grill, here are 10 tantalizing recipes for this classic dish! From a four-cheese filling to a Mediterranean blend of lamb, mint and feta to the American classic of ground beef and rice, stuffed peppers are so incredibly versatile, there's no reason not to make them a regular part of the menu! And psst! Almost all of these recipes are naturally gluten free or super easy to adapt! Try it and let us know how they turn out! This savory-sweet combination brings the exotic to your kitchen, transporting you to a far away land! Featuring traditional Southwest flavors, these peppers are just the right amount of hot and spicy. Vegetarian. For a leaner choice, these hearty peppers are filled with chili-spiced ground chicken and topped with ooey-gooey cheese - what's not to love? This reminds me of my grandmother's peppers which would be stuffed and simmered on the stovetop in a pot of homemade tomato sauce. Rich, hearty, delicious. The perfect way to use up whatever veggies are hanging out in the fridge, this recipe is super versatile and a great way to using up leftover veggies! Instead of using jalapenos, this recipes uses sweet mini bell peppers for a milder appetizer. Filled with a blend of cream cheese and goat cheese and bacon, topped with crunchy bread crumbs, you'll have a new addiction in no time. Vegetarian. Using traditional Banana peppers, these peppers are steamed and then fried for a nice crispy foil to the softness of the filling. Dairy free. 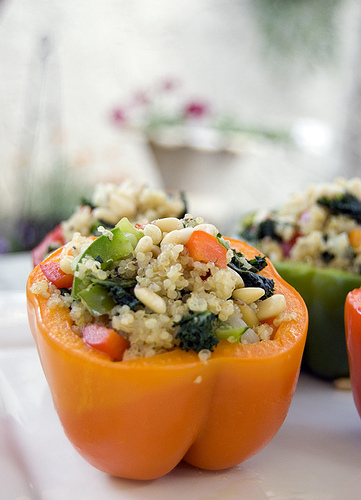 With a vegetarian option (substituting mushrooms for the ground meat) these super tasty peppers will transport you to the Mediterranean shores! Try using tomato sauce instead of water in the pan for an extra rich boost of flavor! Vegetarian / Dairy Free. Leaner than using beef or pork, the slightly smoky filling is perfect for your next fiesta. Summer is officially here, why not celebrate with the perfect grilled peppers, oozing with cheesy goodness? Vegetarian.